The Henry Farm Inn, your tranquil home for the weekend, is known for both its comfort and its role in Chester's long history. The Inn, referred to as a center hall Federal, was built in the late 1700's and was the first tavern in Chester serving as a stagecoach stop on the Green Mountain Turnpike. During colonial times this turnpike ran from Boston to Montreal, but now is a quiet, picturesque dirt road, perfect for biking or a peaceful walk. Original wide pumpkin pine floors, Rumford fireplaces, original hand- hewn beams, spacious country kitchen and simple early American decor are museum worthy. 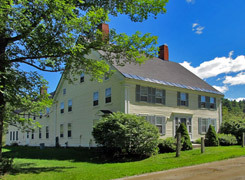 Situated on 56 acres of rolling meadow and forested farmland, the inn offers a private country setting, but is minutes from the charming Victorian village of Chester. Following a great day of cycling, you can take a refreshing dip in the spring-fed swimming pond or cross the dirt road to submerge yourself in the gently flowing river. Dinner is at seven, deliciously home cooked and served by our outstanding hosts, Patricia and Paul Dexter. Saturday we pedal east and south to two noteworthy villages: Grafton and Chester. Most agree that our first stop, the village of Grafton, is the Vermont they imagined…a quaint general store, statuesque white church, and renowned cheese factory with the quiet rumble of the Saxtons River as background music. After lunch at Mack's Place and a visit to the Grafton Cheese Factory (where you can see how their famous cheddar cheese is made and have a taste test) you have a choice of two routes. The short route heads north to Chester while the long route extends west on a lovely back road before rejoining the group in Chester. At day's end, the reward is a treat at Baba-a-Louis Bakery. Sunday we start the day with a visit to The Rockingham Meeting House. Built in 1787, the Meeting House is the oldest public building in Vermont that still exists in a condition close to the original. Next stop is the famous Vermont Country Store, "purveyor's of the practical and hard-to-find since 1946." Several miles later, we arrive in Saxtons River, a village lost in time. This tiny Vermont hamlet with streets lined with 19th century buildings, has recently been added to the National Register of Historic Places. For those who still have gas in their tank, there is an additional loop east, over the Connecticut River and into New Hampshire. Everyone will enjoy the final stretch of cycling on the aptly named Pleasant Valley Road, before concluding the weekend at The Henry Farm Inn.